This is the door of the Hiland Knapp House in N. Bennington, VT. The drawing below of guiloche (paired ribbons flowing in interlaced curves around a series of voids, usually circular) is half of Plate LII from The Architect, or Practical House Carpenter, 1830, by Asher Benjamin. But the pattern on the door is not an exact copy, and for a good reason. A 'running' pattern (like the one in the drawing) does not have a beginning or an end. 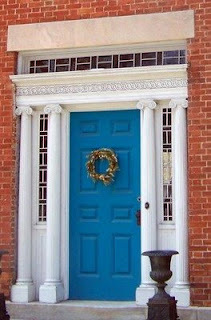 But a front door is the visual focus of a house; it's not on its way to someplace because it is the place. But, adding a curvy piece above the door emphasizes the whole entrance nicely while complimenting the Ionic columns. So what's a builder to do? A simple answer might be to put one circle of the guiloche smack-dab in the center above the door. But it's still a 'running braid': visually it doesn't stand still, it 'runs'. The builder of this house came up with an admirable solution: the pattern starts from both sides, so that the ribbons meet in the middle, in an open circle. Now your eye traces the pattern to the circle centered above the door - and stops. Voila! In 1830, the word was spelled 'guiloche'. By the 20th century the spelling evolved to 'guilloche'.